This card is to honor our Queen for the Day over at SCS – Pam. Who just happens to be one of my followers on this blog! Thank you, Pam! The cardbase is 5 1/2″ x 5 1/2″ in SU Basic Black. Next came two different layers of Bazzill (I’m sorry I don’t know the names.) In designing this card, I knew I wanted to use this designer paper from Kanban but when it came to cutting it…a very hard thing to do! Some pieces of paper in your stash seem to be so hard to use because they are beyond gorgeous. But even though it was tough…I did it! The paper is so stunning it’s hard to put something on it, you just really want to showcase it. 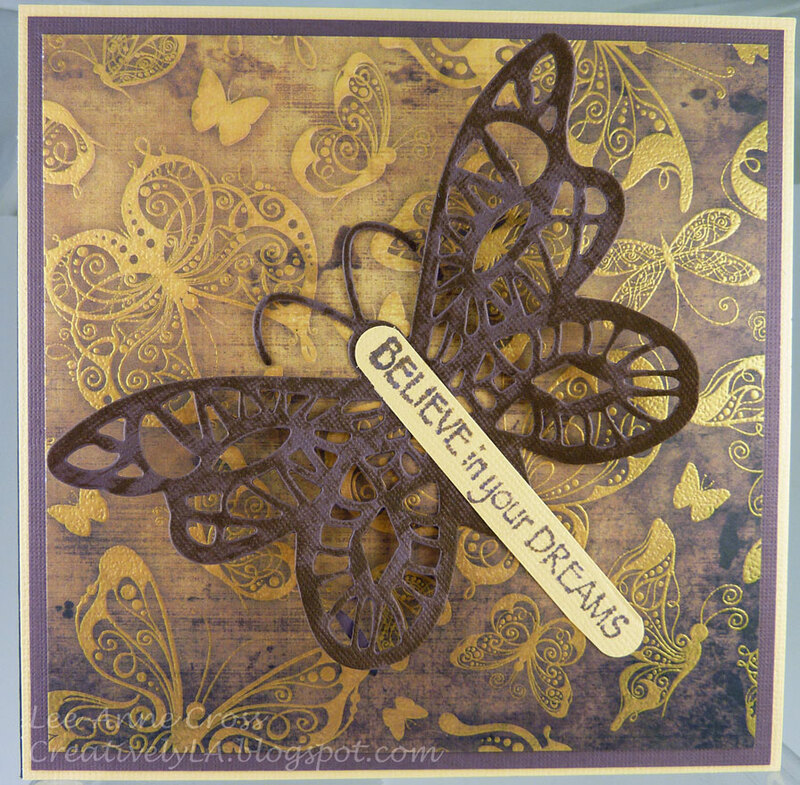 So, I simply used the Cheery Lynn Designs butterfly die and inked the butterfly just a bit. The the Kaiser Craft sentiment was stamped on some Bazzill paper with Tim Holtz Brushed Corduroy. To make any size sentiment strip with this punch, simply cut your strip of paper as thin as possible and then slide it through either end to punch. Lee-Anne, this is a lovely card with such pretty colors!